Fundamental Trends › Blog › Are You Scared Yet? When things seem terrible and people are scared, it’s time to be greedy. What is going on is essentially what we expected, though a bit more dragged out. Traders are bouncing the market around, but it makes me wonder how strong they are if this is the worst they can do. I’m a net buyer and repositioning into higher and higher quality. “And if they insist on trying to time their participation in equities, they should try to be fearful when others are greedy and greedy only when others are fearful” – 2004 Annual Shareholder Letter Berkshire Hathaway by Warren Buffett. Take a look back at our 4th Quarter Macro And Market Outlook and Q4 Playbook Review. And now think about it a little. The first thing that should come to mind is that it’s only been six weeks since the stock market was quite a bit higher. And yet, investor sentiment has actually improved a bit. How can that be with the stock market falling? Well, as I noted recently, ma and pa investors aren’t the sellers in this market. It is the traders. They are talking their game and making their moves, but all they can accomplish is a garden variety correction. Again, ask why? 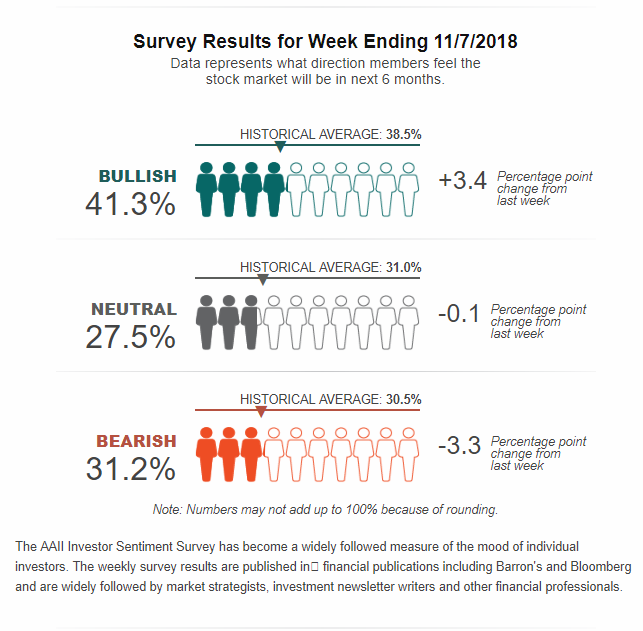 I think it is because the folks who would traditionally be scared out of stocks by traders are feeling pretty good about their situations and are willing to be “long-term investors.” I think this is an evolution investors. Now, I don’t think all of that evolution is good, but not playing with the traders, that’s a good move for most. The evolution that could come to get us one day, and that day is not today in my opinion until I change my mind, is that eventually, ordinary long-term investors will get scared. When they do, they’ll dump their index funds and index following ETFs. That will be a bad week for markets. For now, I’m content getting my money more fully invested and swapping into ever higher quality of investments. I am adding the PowerShares QQQ (QQQ) on almost every dip with new money. I added oil investments last week per articles and the Friday webinar. Tech companies will continue to lead long-term even if there’s a small break short-term. Maybe the world isn’t just getting smarter in technology and industry, but maybe investors are getting smarter. If that’s the case, it’s the traders we are going to be taking from as we wait for their frenzied crescendos and dives into the abyss. Disclosure: I am/we are long QQQ, FSLR, GOOG, AMZN.